Our Funarena! : Tearful Farewell to the Legend! been no landmark or movement or progress achieved or stressful times of Assam that had not been sincerely reflected in his songs. His songs, in fact, have been a genuine document of Assam’s journey through the decades. A tearful farewell to Dr. Bhupen Hazarika on his last journey on his dearest motherland. Since the day of his passing away one and every member of the Assamese community in Mumbai has landed on the hospital premises to offer last prayers. Yesterday, almost all of them were there to bid a sorrowful goodbye to their icon. 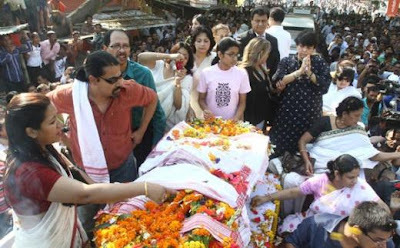 Early morning today Dr. Bhupen Hazarika’s mortal remains had been flown from Mumbai to Guwahati, his hometown in Assam. Thousands of people from all walks of life were everywhere; in the airport premises, in the streets, in the junctions and at every point on the route the last journey passed through. A sea of humanity, descending from all parts of Assam and eastern India. The Legend is now installed in Guwahati’s prime grounds—the Judge Field—for people to have a last look and offer prayers. The last rites will be performed tomorrow—the 8th of October, 2011—at 1pm at Guwahati University campus with full state honors.